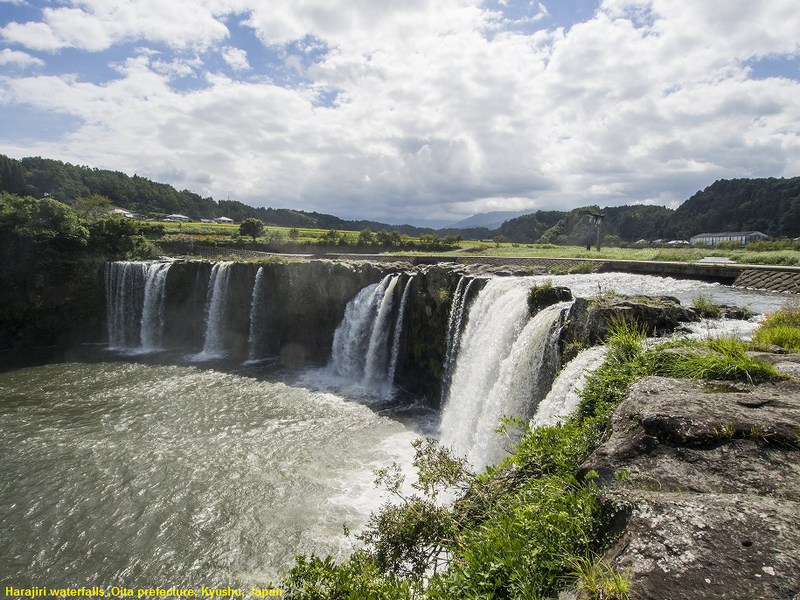 Harajiri Falls are waterfalls located in southern Oita Prefecture and are named on Japan’s top 100 waterfalls. The falls are nicknamed the Oriental Niagara due to the similarities in shape. "Hatarajiri Falls" flowing through Bungoo Ono City in Oita Prefecture is a famous waterfall which is also selected as top Japanese waterfalls. It is a rare waterfall suddenly appearing in the countryside, 120 meters wide and 20 meters high. It is famous for its unique appearence and called "Oriental Niagara" .Falls are high and were formed as part of an eruption of Mt. Aso 90,000 years ago. There is a suspension bridge above the falls and also a pathway down below giving you different ways to experience the falling water.The land suddenly fell down with Ston and the water fell dramatically in such a way as to draw a semi-circular arc there was like the Niagara Falls of the main house.